Best Android Apps, Games, Accessories, and Tips Decoded! You are here: Home / News / Google Pixel 3 XL Gets Leaked Again: Accident or Intentional? Google Pixel 3 XL Gets Leaked Again: Accident or Intentional? Well, well, well… would you look at that? The next iteration of Google’s Pixel lineup got leaked yet again. This time with videos of the phone being unboxed. It wouldn’t be an over exaggeration if I claim that the number of leaks pixel 3 XL has, is greater than the number of stars in the cosmos (I’m joking of course. Grow a sense of humor, would you?). At this moment, we know almost everything there’s to know about the Pixel 3XL. I really don’t think this device needs a separate event for the reveal. 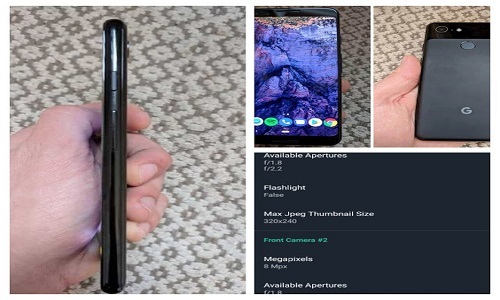 Pixel 3 however, has had little to no leaks thus far until an anonymous Reddit user revealed some photos and specs of the smaller sibling of Pixel 3XL. You can take a look at the images below. We know pretty much all there is to know about the Pixel 3XL. Photos, unboxing videos, and specs. You name it. The Pixel 3XL is has a reveal date of 4th or 9th of October along with Pixel 3 and other Google hardware. However, people are already using it (well, at least some people are). There has been a rumor going on about people selling the device for $2000. And judging by the shreds of evidence, this seems to be true. 2 MP single lens rare camera and 8 MP selfie camera. Although Pixel 3 has had some confidentiality, this week it also got leaked. A few photos of the device have popped up on Reddit. You can check them out below. As you can see, it is not completely breezeless. In fact it has quite a big chin and forehead to house those stereo speakers and sensors. It still looks great though. At least better than the Pixel 3XL. The huge notch on the Pixel 3XL just looks terrible. Also, the specs are pretty similar. So yeah, I’m definitely choosing the smaller brother of the two. Is Google leaking things purposefully? In short, yes. I do believe Googling is leaking stuff intentionally. P.S. Please keep in mind that this is just my opinion. I’m not saying Google is leaking photos and videos intentionally. I just think they are. Let’s put some pieces together. We all saw how many leaks Samsung Galaxy note 9 had. People left and right claimed all these leaks were intentionally done by Samsung themselves. Well, for starters, the note 9 was a very minor update over the note 8. It was a very small iterative update. Some confidential papers that also got leaked showed that Samsung predicted fewer sales for the note 9. They themselves didn’t believe the device was a major update and people would stick to their galaxy 9 or note 8. They wanted people to already know what’s coming their way so that people wouldn’t get disappointed or frustrated. How is this related to the Pixel launch? The answer to that question would be” design”. The humongous notch looks ugly and the overall design of Pixel 3XL just look on per. Some would even say horrible. Google also wants people to get used to this stuff. That’s why I think they are leaking things on purpose. Why I’m still hopeful about the Pixel devices? Google is a software company first. Design was never their forte. I’m pretty sure they are cooking up something really special for both Pixel devices that’ll blow everyone away. We all saw how google made the best camera with a single lens just through their incredible software technique. Pixel 2 phones were controversial when it came to design. But one thing that everyone agreed on was the camera. Pixel 2 camera is still the best camera on a smartphone to date. I don’t know how they would top that. But Google being Google would most definitely do what’s required (at least I hope they would. fingers crossed). Another Pixel device on the horizon? Just a quick disclaimer, I’m not 100% sure about the 3rd Pixel phone. It’s just a hunch. There had been a few easter eggs that hints a 3rd Pixel phone could be coming out this year. The easter egg on the settings menu and other hints suggest this rumor could very well be true. Last year while they were presenting the Pixel 2XL, the at a glance section on the home screen showed “Ultra Pixel meeting in 5 minutes”. We all know where hints like these lead to. So, I’m crossing my fingers again. Once again, I’m not affirmative about the 3rd Pixel device. I absolutely despise the design of the Pixel 3XL (this is me being 100% honest, despite being a Google fanatic). That being said, I’m still pumped up for the 2 new phones. Because I love Google for the software they make. No one can deny the fact that Google is an amazing software company. Specially, when it comes to integrating machine learning with their software. But in mobile phone market design matters a lot. Specially for flagships phones that cost 800$-1000$. I believe this year sale of Pixel 3 devices (Pixel 3XL to be precise) will decline unless Google does something stupendously good with their software. So, what are your thoughts on the upcoming Pixel devices? Do you hate the notch or love it? What do you think about the design language? Will you buy one or will you pass this year? As always feel right at home while posting your thoughts in the comment section below. Hi! This is Gareth. I've had a passion for gadgets for a long time now. Specifically speaking, I'm curious about the Android phenomena and how everything works around it. Yes, even to this date. That's why I keep researching about the new innovations of people surrounding this magic OS. Androidista is sort of a logbook of mine where I write about the amazing things that I found. Hope you like reading it as much as I enjoy putting the articles up for you guys. Cheers! Best Parental Control Apps for Android that You Must Try! Motorola E5 Plus Review: Is It Just Another Budget Phone? How to Cast Your Oculus Go to your phone: Finally… you can! Gareth Stevens on How to Use Google Assistant in 2018 Like a Pro: Tips and Tricks Explained!